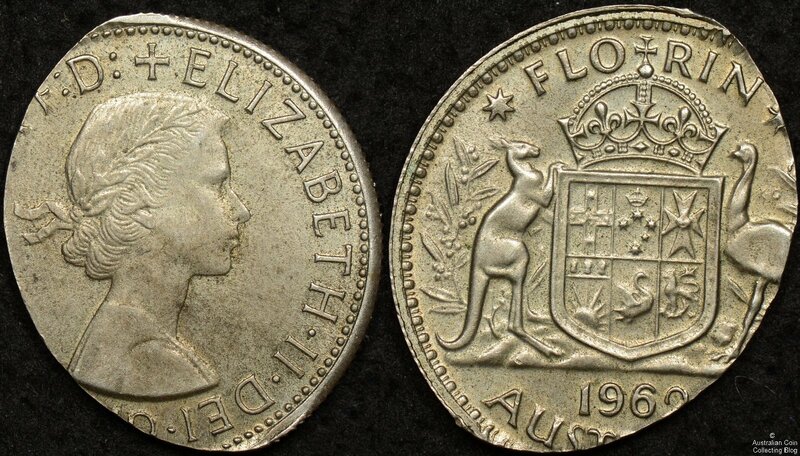 Above you can see a remarkable and rarely seen error, and elliptically clipped or elliptical planchet Australian florin minted for 1962. The coin weighs just 7.82 grams, almost exactly 3.5 grams under the regulation florin mass of 11.31 grams. Now, we’ve talked about elliptically clipped errors before, but it’s worth examining this coin in some detail to prove it’s authenticity and understand it’s origins. How are Elliptical Planchet Errors Made? Elliptical planchet or elliptical clips are a result of a failure in the planchet manufacturing process. This is the process that turns a strip of metal into a round disc that can then be struck by a coin press to form a coin. In the case of this florin, coin blanks were punched out of a thin sheet of 50% silver by dies in a so called “blanking press”. After a blank was punched out the sheet of metal moved along a bit and then another blank was punched out, this happening over and over and obviously at a frighteningly fast pace. But what happens if something goes wrong and the metal didn’t slide along far enough and the second blank punched out overlapped the first? That’s how a clipped planchet occurs. See the image below for a more helpful explanation. As you can see from this image our 1962 elliptical planchet error is a dead ringer for the centre part of the theoretical error shown above. You can use some of the same techniques to authenticate a curved clipped planchet error to authenticate the coin in question here. We’ll examine this coin for radial metal flow, a symptom of either an undersized planchet or a planchet not constrained radially by a collar die. Radial metal flow shows itself on the rim of a coin and also as so called ‘fish tailing’ of the coin legends. Below is a detailed image of the rim of the coin from the top of the obverse. Note that the raised rim slopes gently inwards until there’s no raised rim. This is because the metal flows in preference to the missing part of the coin blank rather than filling up the die. This gentle slope of the rim near the missing part of a clipped planchet is very distinctive. As a matter of interest you can see how the rim beads have also not been formed correctly, slowly transitioning from nicely formed round beads on the right to just a fraction of their correct size on the left. Fishtailing is a descriptive term for the effect that radial metal flow has on the legends of a coin. You can see this effect clearly in the image below. Notice how the top of the letters are thinned and slope up towards the edge of the coin. Notice also how the top of the T of AUSTRALIA is bisected and forms the characteristic fishtail shape. If someone simply cut the edge off of a coin to try to imitate a clipped planchet this fish tailing would obviously not be present and the smart error collector would be rightly dubious of the origins of such a fabrication. In conclusion, we see all the correct indicators that this coin was actually struck on an underweight planchet. It has a distinctive shape and shows the type of radial metal flow you’d expect when such an underweight planchet is struck in a coin press. Elliptical clipped planchets like this one are the most unusual type of clipped planchet error, and it’s always fun to see one on a big coin like a florin.